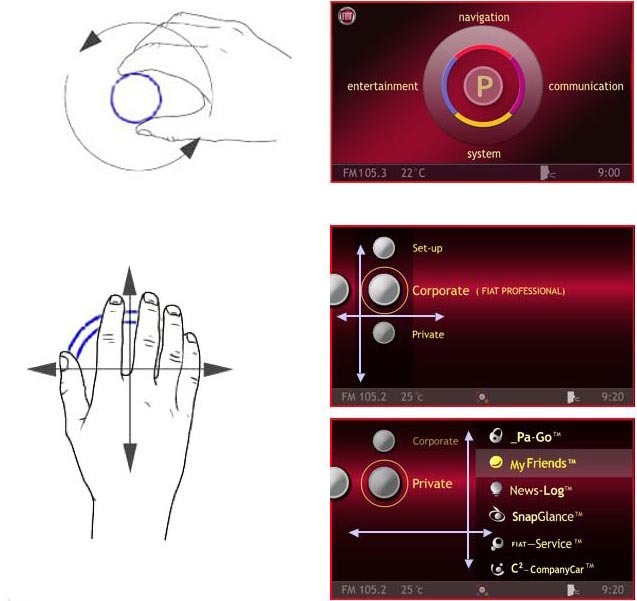 The relationship between the Hardware User Inteface (HUI) and Graphic User Interface (GUI) is of critical importance in automotive design. Above is a Virtual Widget designed by HDS automotive for BMW (in 2008 ) which made it easier for the user to associate rotational movement on the HUI with a corresponding action in the GUI. DHS created a virtual rotational widget which moved in sync with the “idrive ” controller making the interaction more intuitive for the driver. – Easy and intuitive to use. – Easy to navigate by abroad spectrum of users and age groups. – Easy to interact with the related HUI. The GUI needs to consider a number of key parameters: Logic Structure, How to divide the screen, content management, and icon design. Over the last 20 years we have researched and design numerous icons for its clients. The HUI (Hardware User Interface) consists of all the non screen based or digital interaction keys, switches etc. which are operated by the user in his or her interaction with the product. As products have become more digital the complexity of this relation has intensified. 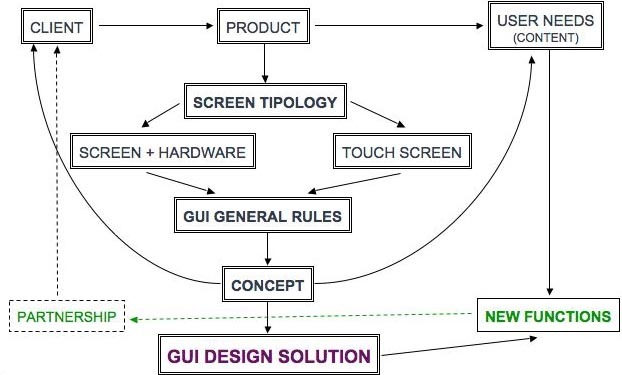 This has resulted in a greater need for interface cohesion between the GUI & HUI elements. Our partners have over 20 years of experience in exploring these boundaries. In the Automotive Sector there is a clear safety issue in an effective and functioning relation between the GUI & HUI interface. 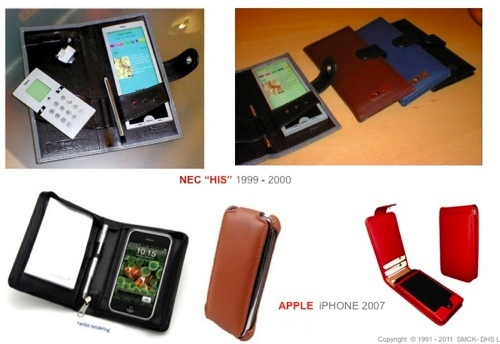 This project developed for NEC, (7 years before the launch of the iPhone) introduced a high level fusion between a the GUI solution and a “High Touch” tactile HUI solution. The HUI design focused on CMF (Colour Material and Finish) to create a quality personal digital product. Voice controls are becoming increasingly common as the precision of the technology exceed s 90%, (the minimum according to HCI expert Dr Masaaki Kurosu). Often there is no real visual linking between voice and other visual elements on the screen. This makes the GUI rules different from those seen previously.